A fashion statement and a tool to inspire positive change in your life! 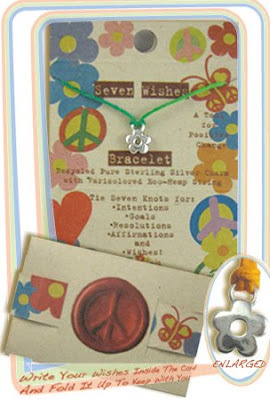 Manifest your dreams with this recycled pure sterling silver Flower charm on varicolored Eco Hemp string! Use these bracelets for affirmations, resolutions, setting intentions and goals and, of course, wishes! All string is hand-dyed and includes variations in color - making each bracelet one-of-a-kind...because you are! Wow! It´s really cute!!! Love the peace, love, earth concept!